April | 2017 | #Hope lives! Today I spent time studying the first verse of the over 1,200 verses in the first of our four Vedas, commonly known as the Rig Veda. When in doubt, wise men have told me to try and go to the source of the doubt. So I sought out the most ancient chant in our tradition. What could an ancient verse that survived many millennia in a spoken tradition, chanted by priests and their families, till writing was invented, tell me? Ancient Sanskrit has changed and one has a problem understanding it, but the message of the verse; is a bedrock of Hinduism and clarity shines brightly through in an intensity, that shows the clear thinking, of the ancient mystic who wrote it. Well any of us who have invoked Vedic Mantras while lighting Agni in the Havan kund know the ritual well. We start with (water, samagri, ghee and samidha) dry wood kindling and special mixture of natural items found in nature, to purify the air and raise the sacred flame of Agni within and without. We know that its a homage to the fire of creation, which burns in each and every one of us. It is only now when I have had the pleasure of reading the first verse of (our strutis) or knowledge passed down, by the invokers of the devas. The ancient sounds have not changed much from when they were first spoken, to express human ecstasy, while conducting the fire sacrifice (Havan or Homa). It is we who have forgotten them, and the ancient rishis still lead us to the righteous path. It is rumored that when Edison asked his friend Max Muller to do his first recording for human history. Max recorded this first verse for posterity. This first recorded sound kept up an ancient Indian spoken tradition, unbroken in recorded time, and still alive as originally spoken. So the ancient seer spoke these words and passed them on to his progeny, generation after generation, from the time the Arya arrived in India, and made it their own home. I am a product of these settlers in the rich valleys of the five rivers in the northern plains of Hindustan, in a region now known as Punjab. 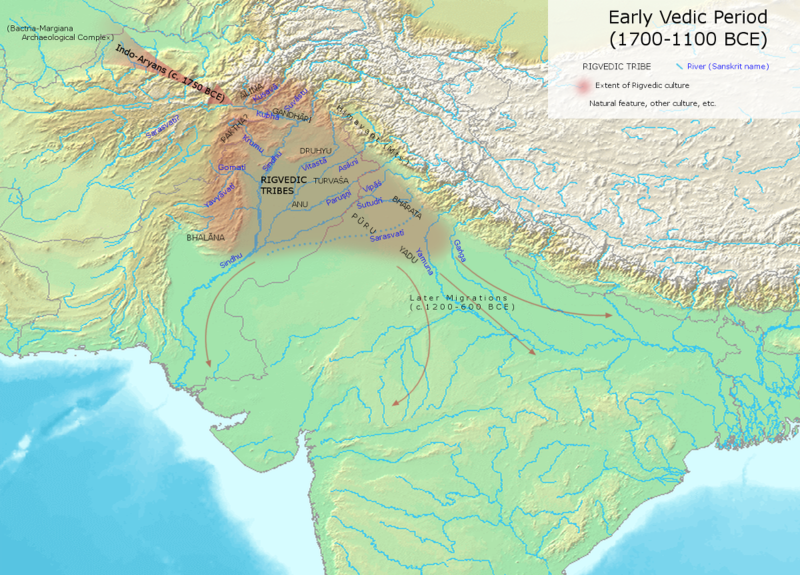 The Indo-Aryan migrations started in approximately 1800 BCE, after the invention of the war chariot, and also brought Indo-Aryan languages into India. In the Epic Mahabharata Arjun rides a war chariot and Krishna is his charioteer who drives and protects him and pulls the chariot up in between the warring cousins on the ancient battlefield of Kurukshetra. The sun reflects off of the bronze protective plates of the war ready warrior, as he throws down his great bow and questions why he must bring death on his near and dear ones. The chariot stops and we hear the Bhagavad Gita from the mouths of Arjun and Krishna (as described to the blind king many miles away by the seer Sanjay). The Gita is considered a condensation of the Vedas in some ways, as it lays out men’s duty to society, religion and knowledge. So while the first verse of the Vedas spoke so much about internal ecstasy, the Gita gave us a whole new religious philosophy, showing many paths. We in the Arya Samaj strongly believe, that the Vedic tradition is one of the most noble ways of life, and those who follow it will become Arya, or the enjoyers of inner peace and contentment . We will always strive to become learned, and do this by hearing from others and also passing on what we learn, to teach others. We study the ancient texts and my mother used to do a daily Havan for man years, even in the worst of times, when she became a refugee in India, after the partition. The internal light in her lived on through life’s ups and downs, as it did in my father who was also a karma yogi. Their joint reciting of the Sanskrit verses during festivals and social occasions was a reminder to us that the pursuit of knowledge, would bring its own rewards. We have lost our way in the current age of Kalyug or dark times,and Satyug or Truthful times will come again in our future, when we are free from Maya. Till then we can recite the verse and have faith that the promised treasure awaits us, and it is we who are wanting. Our ancients gave us such a powerful message of hope in the opening verse itself, that if none other had followed, Hinduism would have still lived to its modern form. The power of the tradition where an ordinary conductor of the ceremony becomes the raiser of our inner faith is so powerful a construct, that it needs no other external support. Hence Hinduism has lived through the ages largely unchanged, often reformed; yet the work, never quite completed. We return in the end to the funeral pyre, where the body is disposed off by Agni, but the soul is not burnt; and it rises to either live forever in its ecstasy, or try again in a rebirth. So life begins and ebbs, rises and falls, in the rhythms, of these ancient verses. We have to just stop and breathe evenly, recite the ancient and sacred words, pour the ghee and samgaree on the kindling and pray. If we look hard enough at the fire burning outside and say the right words, our inner fire flames up, and the rest of the day is full of an awareness of love for nature and our universe.Imagine yourself as the Purohit and say the words that will bring you to your personalized ecstatic treasure. Life does not become more intense than this verse in its simplicity and power, so enjoy!. During the Napoleonic era a great man who pioneered sociology, statistics, epidemiology and gave us perhaps the clearest glimpse into urbanization, was Louis-René Villermé (10 March 1782 – 16 November 1863). I consider him the earliest known man who studied economics, sociology and did research and established statistics that became the base, for many of French reforms for how people lived and worked. He advocated against child labor when their nimble fingers were busy working the tools, of the first Industrial revolution. We have much to thank him for his studies of industrial workers, prisoners and he established the earliest linkages between hygiene and health, and between poverty and their poor growth, and their early death. In his great French book “Study of the Physical Condition of Cotton, Wool and Silk workers” a most comprehensive current state of the working people and their moral and physical life, is indeed a gift to our history. With the rapid urbanization that has taken place from the eighteenth to the twenty first century, the evolution of our cities and their populations is truly remarkable. So much we take for granted like safe drinking water, modern sewage systems, hygienic working conditions, reasonable work\life balance, were all unknown in Villerme’s times. He was a modern man and liberal who showed the path for better urbanization, to improve our human condition. Previous changes took centuries to evolve as we have seen, but in the modern world change is going to arrive faster. Machines are now evolving at a very fast phase to take over the routine drudgery, of modern manufacturing and information flows. More robots and bots are doing increasingly more sophisticated work repeatedly and endlessly, without getting tired, or exhibiting any human error. We have evolved to become masters of a rapidly changing universe. Every day new cures are found or are being actively worked on, for old diseases and human conditions. We have achieved a level of health and happiness in our modern society, with the base needs of food, shelter and security being largely taken care of. We owe so much to the great thinker who have come before us. The prime example is of Villermé who covered a wide array of subject matter including: children in the workplace, savings accounts, asylum rooms, and drunkenness among the working class. The work was unique in combining health topics with research and social reforms. We have come a long way since that pioneering work but now the need is even greater. We have to prepare before the next devastating pandemic overtakes us. We have to continually improve our living and working conditions for the billions, who inhabit our earth. We are all of us, in this together, and to ignore development for some, and to allow only the few to enjoy the fruits of what we have achieved, is meaningless in a flat and seamless world. Our path is to Go forward from here. Striving for global happiness through rightful living, should remain our only goal.